We sell high quality replacement belts for Go Karts and UTV/ATV's, Timing belts, belts for Elliptical and Treadmills, Industrial Power Transmission belts, Link V-Belts, CVT belts, Poly V belts, Air Compressor & Power tool belts, Lawn Mower belts, and More! Home > Variable and Multi-Speed Belts > MULTI-SPEED BELTS > 1430V500 Multi-Speed Belt, Industrial Grade. > 1430V315 Multi-Speed Belt > COMET 300668 (A-DF) Comet Industries belt > ASW 2-20693 CVT Belt. American Landmaster, Manco 2-20693. Order Online 24/7. WE SHIP ASAP! Sales and Support: (317) 519-9020. CLOSED WEEKENDS AND HOLIDAYS. *US Postal Service price increase effective Jan. 27, 2019. Thank you. We appreciate your business! 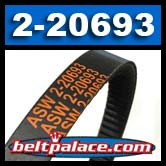 ASW 2-20693 CVT Belt. American Landmaster, Manco 2-20693. 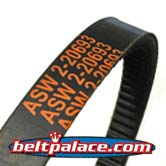 ASW 2-20693 American Landmaster Belt for UTV/ATV. Genuine ASW part. Manco/American Sportworks (ASW) 2-20693 CVT Belt. 2-20693: BELT, CV TECH-NEW UTV's. Drive belt for Brister’s Chuck Wagon (CW-11 and CW-13) and Land Master with Comet Industries Torque Converters with belt of same number. 2-20693 Belt, Kevlar (Aramid) reinforced. PLEASE CHECK MANUALS, SERIALS, AND/OR BELT NUMBERS BEFORE ORDERING. LIMITED TIME SALE PRICE. ORDER NOW! Tel. (317) 519-9020 Mon-Fri. Closed weekends and holidays.